'Findlay' is an independent evangelical church meeting in a large building situated between Glasgow's City Centre and the West End. The church is unusually set behind a row of tenement flats with an entrance off Clarendon Place at St George's Cross. We are a growing church with people coming together to worship from all walks of life. We seek to be friendly and welcoming and encourage people to get involved in the life of the church. We also have a strong presence within the community in which we are placed. We value the links we have with students in the city and seek to help them integrate into the church family while they are in Glasgow. Alongside our Sunday services we have a wide range of activities running throughout the week for young and old. We also place a strong emphasis on regularly meeting in small groups. While being independent as a church we are Baptist by persuasion. When the students are about we have at least 350 at our morning servies, and around 200 people in the evenings. 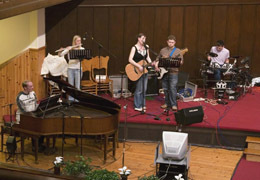 A number of gifted musicians and singers help to lead the worship. We value highly Bible-based preaching and teaching as we seek to build one another up in our faith.